Post 5 - The hidden DNA of credit cards | No Mas Coach! I’m willing to bet that if you’re like any normal American, you’ve got at least 2-3 credit cards in your wallet right now. I know a couple people who carry 17 and it’s not even a wallet, but a binder! But the real question is if you know the real value of your credit cards and the special benefits that they have. In this post you’ll find out about some of the most common benefits credit cards offer and how to see if yours does too. Credit cards carry so many benefits, both stated and hidden deep in the terms and conditions that you threw away (I know you did!) when they sent your new card. Cards offer purchase protection, price guarantees, insurance protections, and many other benefits. We’ll talk about a few of them today in detail. Call me crazy, but I’ve always believed that a credit card company will go to work harder for their money than for yours. It’s for that reason that I don’t use my debit card for purchases anymore. It’s too easy nowadays for people to get your debit card number whether it be from a credit card skimmer to just plain luck. I’m sure that everyone reading here has been the victim of fraud on their accounts before, and there is no worse feeling that seeing a charge that you don’t recognize as yours or you know is fraud. When you use your debit card, the money is instantly taken out of your checking account, but when you’re using a credit card, the money is on the credit card account, and you have time to dispute the charge . Remember that one of the many stated benefits of 99% of the cards out there today is Zero liability for fraudulent transactions. One of the many hidden benefits of credit cards is purchase protection. Did you know that a lot of credit cards offer extended warranties for each product that you purchase? Extended Warranty Protection extends the time period of the original manufacturer’s written U.S. repair warranty by one (1) additional year on eligible warranties of three (3) years or less, up to a maximum of ten thousand ($10,000.00) dollars per claim, and a fifty thousand ($50,000.00) dollars maximum per Account. To be eligible for coverage, you must charge some portion of the item’s purchase price to your Account or use reward points earned on your Account toward the purchase. This benefit is secondary to any service contract or Extended Warranty you have purchased or received. Pretty sweet deal, right? If the manufacturer warranty is for 1 year, you’ve got another year right on top (assuming that you paid for the item with your Sapphire card). Ever had a flight delayed or cancelled by weather and the airline would refuse to pay for your expenses because “Acts of God” are not covered by the airlines? So the benefit is either for a more than 12 hour delay OR requires an overnight stay. I recently took advantage of this benefit when a flight was cancelled out of Atlanta and I had to be put into a hotel for the night. The airline wasn’t paying, but because I knew about this through the credit card, it was an easy claim to file. 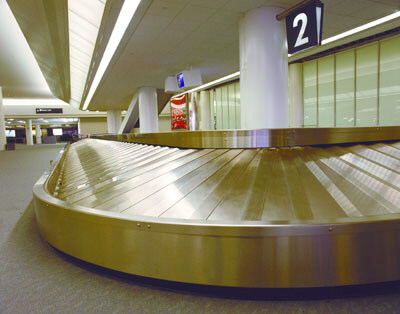 One of the worst feelings is when you’re waiting at the baggage claim area and you see everyone else reaching for their bags, thinking soon that “mine is next… mine is next…” and then, the baggage carousel stops moving. Your bag is no where to be found. You head over to the baggage office only to find that your bag is 5 states away, and at best, you’ll get your stuff within a day or two. Just give them your address and a helpful associate will find you and get your bags to you. Right… now what are you supposed to do with your vacation? With no clothes and no supplies? Enter the credit card to the rescue! Photo from BAE Automated Systems, Inc. The Baggage Delay benefit is an insurance plan that provides reimbursement of the emergency purchase of essential items if an Insured Person’s baggage is delayed or misdirected by a Common Carrier for more than six (6) hours while on a Common Carrier Covered Trip. • The plan is automatically provided to you as a Chase Cardholder and your Immediate Family Members at no additional cost to you. When, on a recent trip to Copenhagen, Ben’s baggage was lost for 3 days. He went out and bought himself an entirely new wardrobe, courtesy of Chase. British Airways told us that since they knew where the luggage was and they would have it to us the next day, that we weren’t entitled to any benefits. No problem, our credit card had our back. On top of all these other benefits, your credit card might offer Price Protection, Travel Accident Insurance, Car Rental Insurance Coverage and more. Call your credit card company and get a benefits guide so you can find out about the benefits that are included for you. In a previous post, we also mentioned the benefits of Visa Signature and MasterCard World Elite. You can find that post here. Your credit card could be saving you hundreds if not thousands of dollars a year, and you’re just not taking advantage of the benefits. I’ve been guilty of ripping open a package and throwing away all the paperwork before too… so don’t feel bad if you didn’t know these things existed before today. Apart from the points or miles, the foreign transaction fee waivers, balance transfer offers, and other benefits you knew about, there are usually a suite of benefits from both the issuing bank and the provider (Visa/Mastercard/American Express) waiting for you to take advantage of. So put down your laptop or phone, go get your wallet, and call and ask for them to ship you out a benefits guide today. You might just learn something!